The Everest Base Camp trekking is arguably the most famous trek route in the world and this is a once in a lifetime opportunity to see some of the most breathtaking scenery imaginable. Nepal is a fascinating country and the trek Everest base camp trek gives an insight into the lives and culture of the friendly Sherpa people. During the trekking seasons there are numerous daily flights into and out of Lukla, weather permitting. The flight from Kathmandu, which takes around thirty-five minutes, passes over the fertile middle hills, with their scattered villages and terraced fields, with an amazing panorama of the high Himalaya as a backdrop. Before long the mountains close in and you are sweeping down to land at the gateway to Everest then you start your trekking next day you reach Namache Bazaar where we suggest to rest for acclimatization. There are two routes lead without high pass to Everest base camp one going though Phortse village and another directly via Tengboche is a normal route to Everest base camp. If you prefer just to go Everest base camp then return that we don't suggest because without visiting Kala Pattar (5555m) is not interesting as you expected so this stunning trek visits both, Everest base camp and Kala Pattar, a viewpoint recognized as the best vantage point to see Mount Everest which is a premier goal for many adventurous walkers in the Himalaya. After Everest base camp and Kala Pattar same way trek back to Lukla then catch morning flight to Kathmandu. Best Season: February, March, April, May, September, October, November & December. Day 16 Memorable Nepal Day concludes sunrise View at Nagarkot, sightseeing at Bhaktapur and Nepalese dinner in typical Nepalese cultural setting. 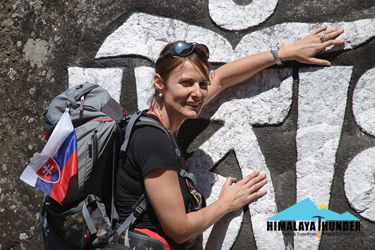 Note: Presented Itinerary is our tentative plan to make your Nepal experience rich. It can be customized as client's interest and timeframe.